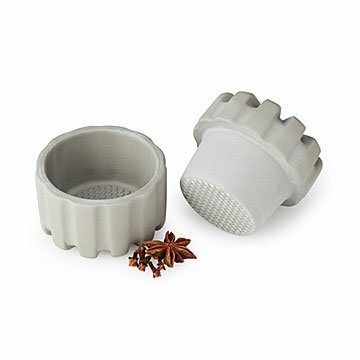 Enjoy vibrantly flavored fresh-ground spices with a genius mill design that makes precise grinding a snap. Once you've tasted the vibrant flavors of freshly ground spices, you know they're totally worth the effort—especially with this genius design that makes fast, precise grinding a snap. Measure your spices into the porcelain container, put the top piece in it, and twist. The teeth on both parts pulverize whole spices like peppercorns, cloves, or cinnamon. After you've used it a few times, you'll know how much twisting will achieve the fineness or coarseness you want. To crack tough spices before grinding, put them in the container and use the top to pound them a few times. There's nothing to plug in, and it looks so good you'll want to keep it handy on the counter. Made in China. 2.5" H x 3" Dia.